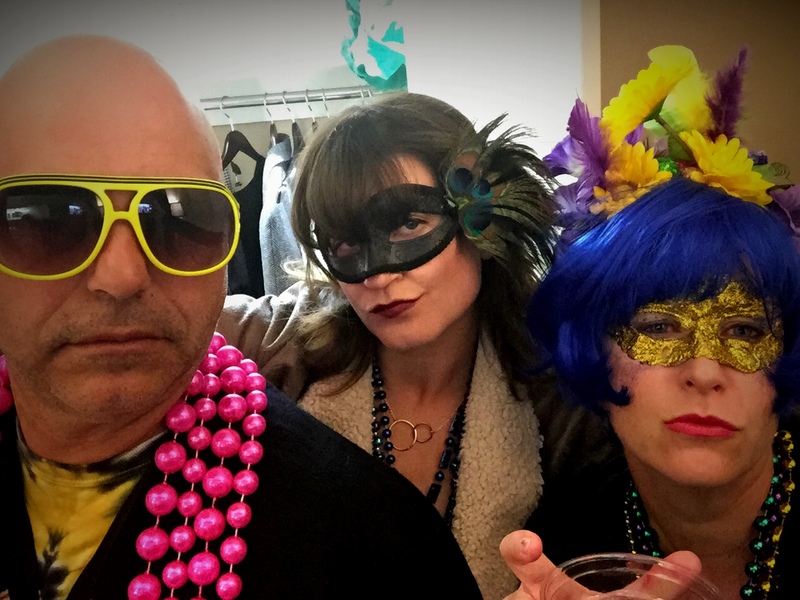 I just got back from New Orleans where I spent Mardi Gras with some of my good friends. Although I have visited the city numerous times I had never been to a Mardi Gras celebration(s) before. It was a new experience and I loved it. 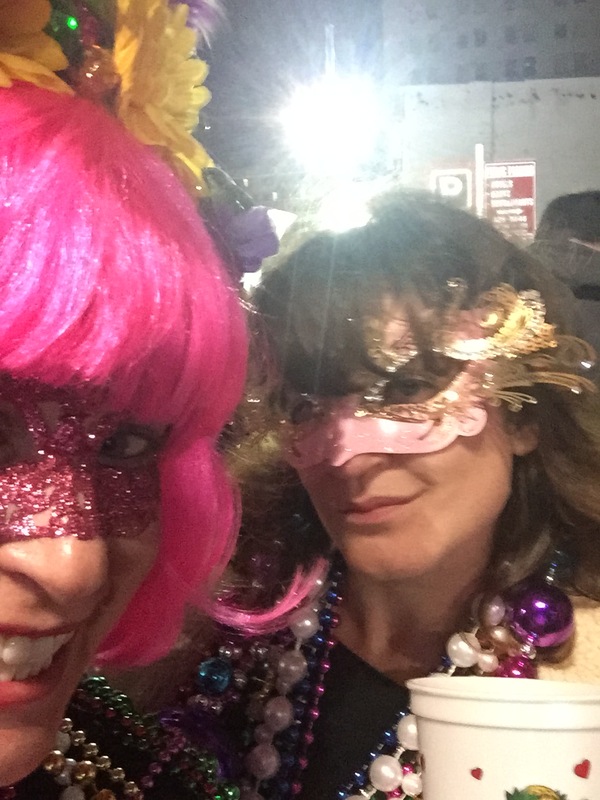 I wish I could live in Mardi Gras-land all the time. My liver does not. 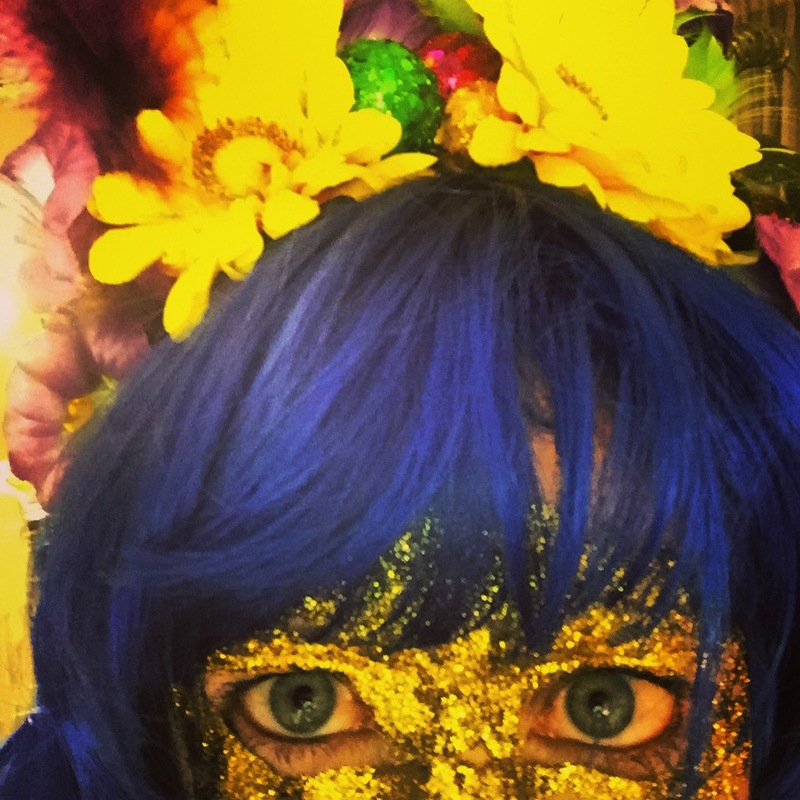 Blue hair and gold mask! When doing research on the festivities I realized I would be able to dress up EVERY DAY. I immediately did a happy dance and brought down my box of wigs. My biggest concern was that I didn’t have any Mardi Gras face masks. What’s a girl to do? 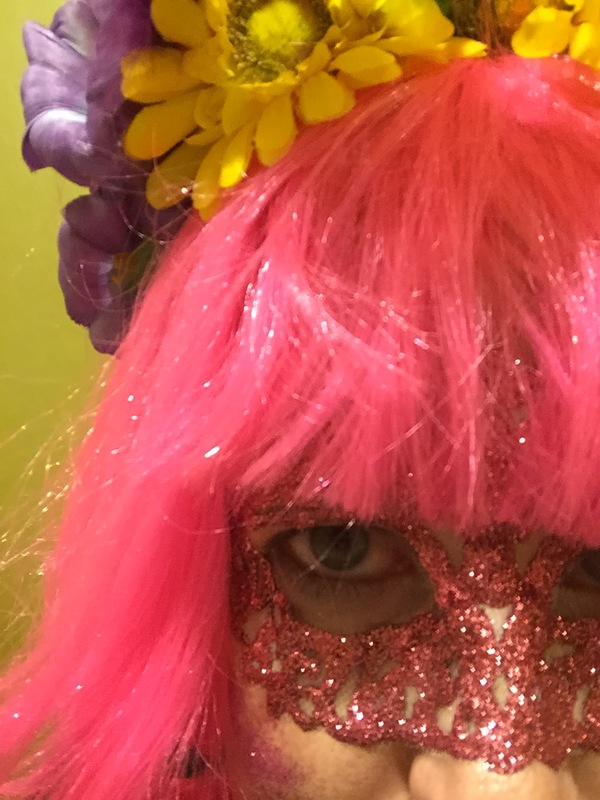 After spending some time on that wonderful web site called Pinterest I found this post – http://sprinklesinsprings.com/2011/10/chic-masquerade-diy-mask-template.html. It looked easy enough. I had also learned that the cool and hip thing to do with this light masks is to glue them to your face vs. tie them on with a string. Gluing random objects to your face my scare other people but not me! If I’m going in, I’m going all in! * That mask template is for a child or toy doll. I have a small/skinny face and I still had to enlarge the picture before printing it out. I’d share that with you but I didn’t save it so you will have to re-do that work on your own. Valentine’s Day hair and mask. multiple templates together on my counter and just rolled the white tulle over it. Don’t do that. Cut a little square of tulle out for each mask. That will help keep it from sliding around too much. * The paint pen I used was fatter than what I would have liked. I think a skinnier point would have made for a more elaborate and delicate design. Mine mushed together a bit. It also didn’t help that I covered the ENTIRE THING in glitter. For reference the ones I made were all done with black paint pen. You can’t tell … all you can see is glorious glitter! I highly suggest you add glitter. * After making a few masks I gave up because I didn’t think it was working. The next morning when the ones I had made were dry, I realized it had worked and they were glorious! Don’t fret too much if it doesn’t look all that great at first. * You can make them – OR — You can go to the store Fluerty Girl in the French Quarter. They sell the masks there for $30. Seriously SAME EXACT MASKS …. SAME PATTERN …. EXACTLY THE SAME. Now for the part that Sprinkles in Spring doesn’t talk about … the gluing. To glue glitter and puffy paint tulle on your face you need to go purchase some eyelash glue. One little bottle of glue allowed me to glue on 3 masks. I probably could stretch it to 4 now that I know what I’m doing. Lie the mask down on a table upside down. Using a q-tip put eyelash glue all over the back (If you have a tiny brush that would probably work better). Put the mask on your face by starting at the bridge of your nose and working out. You will have to hold each section down for a bit to get it to stick …. just like you would your eyelashes. Once the mask is in place you can add glue to any areas that needs extra help. This seemed to happen most around my eyes and at the sides of my nose. Now give it some time. You are going to feel weird and think I am just playing an elaborate joke on you. I’m not. It talks a little time to get use to. Let the glue fumes go away so your eyes don’t hurt (what we do for beauty and fun) and give yourself time to figure out facial expressions aren’t going to harm your mask. 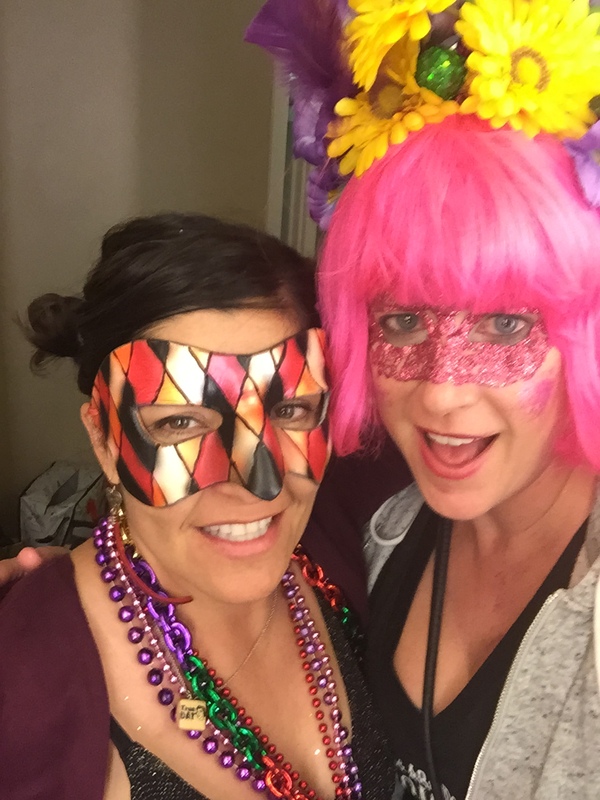 Believe it or not the glued on mask is WAY more comfortable than many tied on masks (I wore both while in New Orleans) plus you don’t have to worry about retying it over and over again. When you are ready to go to sleep just peal it off your face and wash off any extra glue that is still hanging out on your cheeks. The mask can be worn multiple times. I wore glued masks two nights in a row. After that my face needed a time-out. Still, I wish I would have made more since they were so fun! There you go! 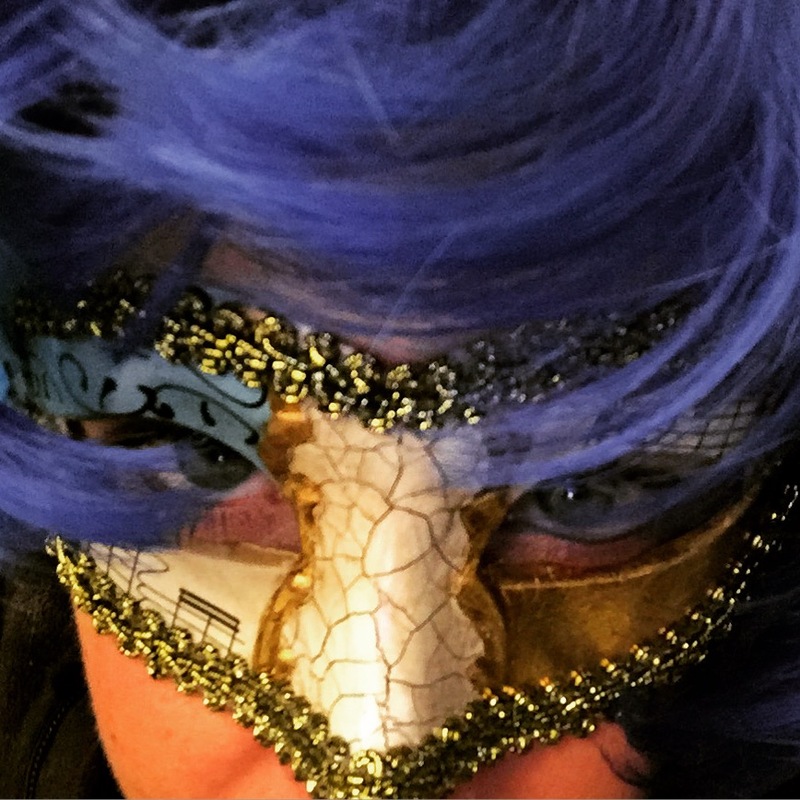 The best Mardi Gras masks are just a craft store away.